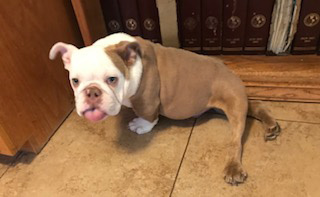 On December 22, 2018, this beautiful, and disabled, Bulldog Puppy was dumped in a Lynwood, CA, park and left to die. Park employees found him and called Lynwood Animal Control. Animal Control took the Puppy to the Animal Emergency Medical Center in Torrance CA for evaluation because the Puppy couldn’t use its hind legs. Medical Center employees knew the Puppy faced euthanasia since a disabled puppy would not be adoptable through Animal Control, so Animal Emergency Medical Center employees called SoCal Bulldog Rescue (SCBR). Time is valuable in cases such as this because Animal Control can pick up the Puppy at any time for euthanasia. SCBR volunteers responded immediately to the request from the Medical Center and was able to secure the Puppy they named ‘Eddie’. 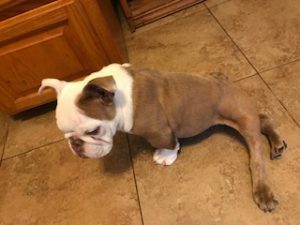 In many instances, when Bulldog puppies can’t use their back legs, it’s due to Spina Bifida, a birth defect involving abnormal prenatal development of one or more vertebrae often resulting in rear leg paralysis and incontinence. 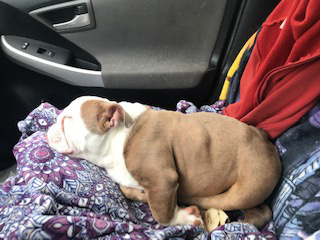 But Eddie doesn’t show all of the Spina Bifida symptoms and we are thinking, albeit hoping, Eddie’s back legs can be surgically corrected to allow him to walk and be a puppy! Yes, after radiograph & clinical review, the orthopedic surgeon felt Eddie could regain, at the very least, 75% of rear leg functionality. The estimate for Eddie’s specific orthopedic surgery is approximately $2,500. 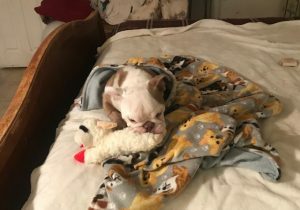 But before orthopedic surgery, the surgeon said Eddie needed a neurology review to make sure there isn’t any spinal issues. Orthopedic surgery on Eddie’s back legs would not be successful if there are any spinal issues that isn’t addressed first. So, off Eddie goes to the Neurologist! The Neurology surgeon said Eddie needed an MRI, spinal tab, and neospora bloodwork. The cost for the neurology work is $3,041.20 (this document is included here). To help SoCal Bulldog Rescue manage the cost to give Eddie the opportunity to walk, Eddie’s foster parent has paid for the orthopedic and neurology consults with each surgeon. Eddie is only 4 months old, he deserves the chance to live as normal a life as possible. SCBR relies on its devoted contributors and wonderful donors to help give Eddie a life with legs. We thank all donors for their caring and love of the English Bulldog. Thank you kindly for donating to Eddie. MRI; identified a cyst on Eddie’s spine which has caused paralysis of his back legs. 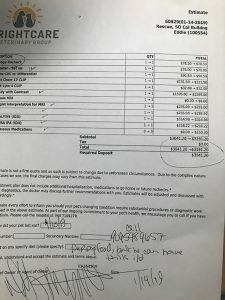 The final cost for Eddie’s diagnostic tests came to $3041.20. 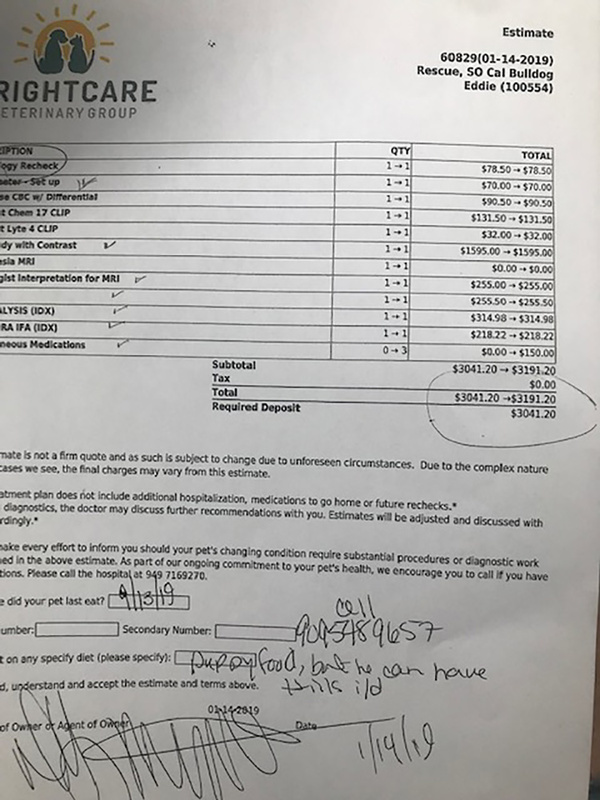 Fortunately, Eddie’s condition can be corrected surgically, for $4,811.00 (Estimate included here!). And his prognosis is excellent! This brings Eddie’s total care to $7,852.20. Going from paralysis, being dumped in a park and left to die, to being able to walk and be totally loved and cared for is a true gift from heaven! Thank you to all of you who have given Eddie the chance to live, to live a wonderfully loved life. I breed, raise, and show Bulldogs. My primary goal in doing so is to better the breed for not only showing but for folks who want a pet that will live a long and healthy life. 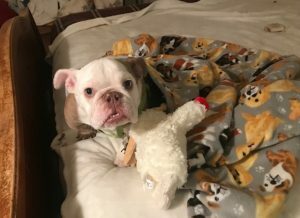 By donating to Bulldogs in need, especially benefiting, SoCal Bulldog Rescue, I feel I have helped the breed by giving the less fortunate Bulldogs a chance to live a happy life. I read somewhere once… for every Bulldog litter you have, you need to foster, sponsor, and donate to another Bulldog. I’ve committed to this philosophy and many others should consider this as well. Hi, this is Michelle from Torrance! It really hurts when you see something like this, that people are so hurtful to animals . It really hurts when… you see something like this, that people are so hurtful to animals . Hi, this is Michelle… from Torrance! 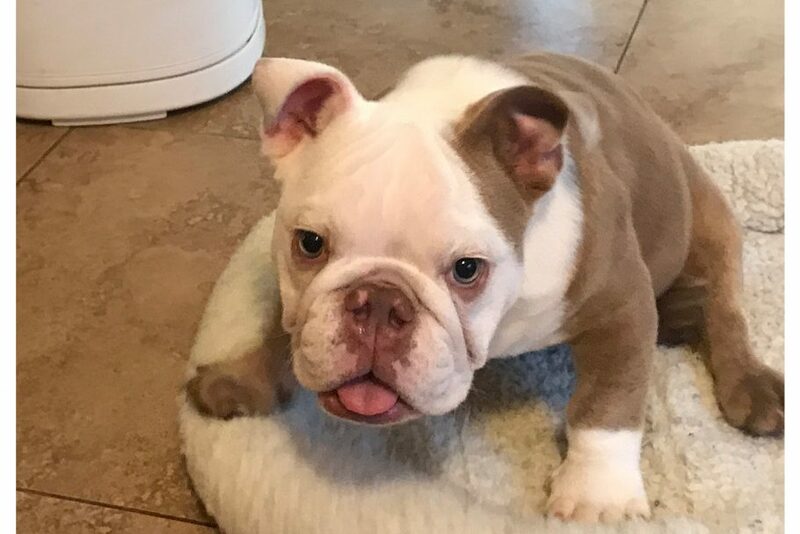 I breed, raise, and …show Bulldogs. My primary goal in doing so is to better the breed for not only showing but for folks who want a pet that will live a long and healthy life. By donating to Bulldogs in need, especially benefiting, SoCal Bulldog Rescue, I feel I have helped the breed by giving the less fortunate Bulldogs a chance to live a happy life. 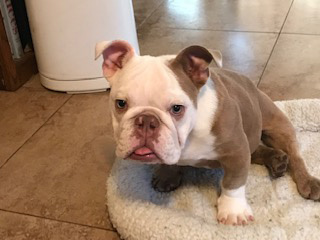 I read somewhere once... for every Bulldog litter you have, you need to foster, sponsor, and donate to another Bulldog. I've committed to this philosophy and many others should consider this as well. Think about it. Eddie is a very fortunate pup now! He has received a prayer blanket from Fur Angel Blessing Blanketers, known as FABB. Included with Eddie’s prayer blanket, and an adorable lambie-pie toy that he just loves, is a wonderful letter. I’d like to share the last paragraph of the FABB letter sent to Eddie: “I pray that your blanket will provide you hope, security, comfort, and warmth, as you begin an amazing new life filled with love & joy.” What amazing people the FABB folks are, not only making Eddie’s prayer blanket, but blessing it in order to provide us faith and hope in Eddie’s journey to health and happiness. Thank you FABB from the bottom of our hearts. 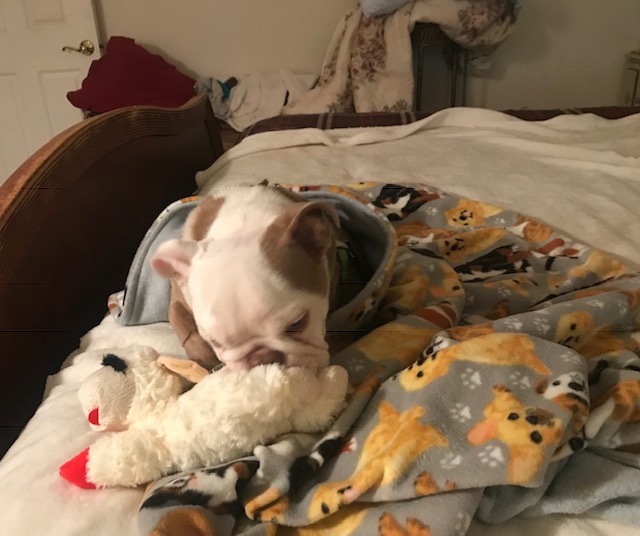 Please enjoy the pictures and video of Eddie with his prayer blanket and toy.